The Rt.Hon. 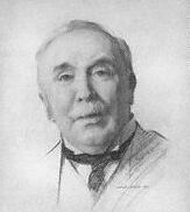 Sir Henry Campbell-Bannerman (7 September 1836-22 April 1908) was a Scottish- born British Liberal statesman. He served as Prime Minister of the United Kingdom from 5 December 1905 until resigning because of bad health on 3 April 1908. Campbell-Bannerman was born in Glasgow, Scotland, in 1836 as Henry Campbell. The surname Bannerman was added to his surname in 1871 as required by his uncle's will. It was a requirement of his inheritance of his uncle's Kent estate, Hunton Court. Statue of Campbell-Bannerman in Stirling. Henry Campbell-Bannerman Facts for Kids. Kiddle Encyclopedia.